Dot Matrix Hologram Mastering laboratory makes use of smaller units or dots, where each dots is a representation of a hologram. Dot Matrix Hologram Mastering Laboratory has a feature of having lots of kinetic movements. As a result, it gets very bright and colorful makes it extremely attractive. Dot Matrix Hologram Mastering Laboratory has several regular uses as well as for business purposes. Such a well equipped laboratory helps to produce a lot of dot matrix hologram and they are extremely useful in the implementation of dots in hologram. Moreover, these dots have unlimited computer control and are engraved with laser beam. These Dot Matrix Hologram Mastering Laboratory actually help in producing various products that includes Micro-Text, Encryption Design, 3D Holo-Patterns. These Dot Matrix Hologram Mastering Laboratory are usually available in 1500 dpi or 2000 dpi. 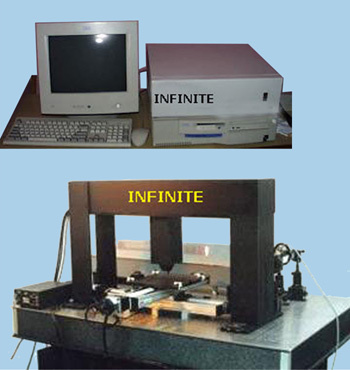 Our Dot-Matrix machine is one of the best dot array mastering machines now available for security holography, in terms of features and resolution. These mastering machines produce ultra high security Dot-Matrix glass master holograms and (Optical Variable Devices) OVDs with extremely complex image content. Quick in-house origination of high security master holograms from computer generated image content. The system also has honeycomb vibration isolation with pneumatic legs, to avoid possible external noise vibrations. System Information of Dot-matrix Master Shooting System. Dot-matrix Artwork Designing software which consist of very user friendly software for creating. Two Software Usage Information brochures with inbuilt help. Dot-matrix Master Shooting System Structure with vibration isolation system consisting vibration isolation table with pneumatic legs. Optics Position Setting, Kinds of Optics adjust to make Laser Beam good for shooting and software will enable to choose angle of recording and all other intensity parameters. Automatic Platform Parameter setting capable of creating Stereogram and any combination of 2D/3D Holograms. Inbuilt controls for laser adjustments, plate loading and resolution selection. Software module that helps to choose the type of hologram to be recorded. Chemical formula and chemicals for hologram glass master development. Master Developing kit which includes all techniques for development after shooting. Master Slivering chemicals and a silvering system for making silverised glass master for electroforming.